June 7 Saturday More pleasant, & tho' Mer only about same, seemed warmer again. 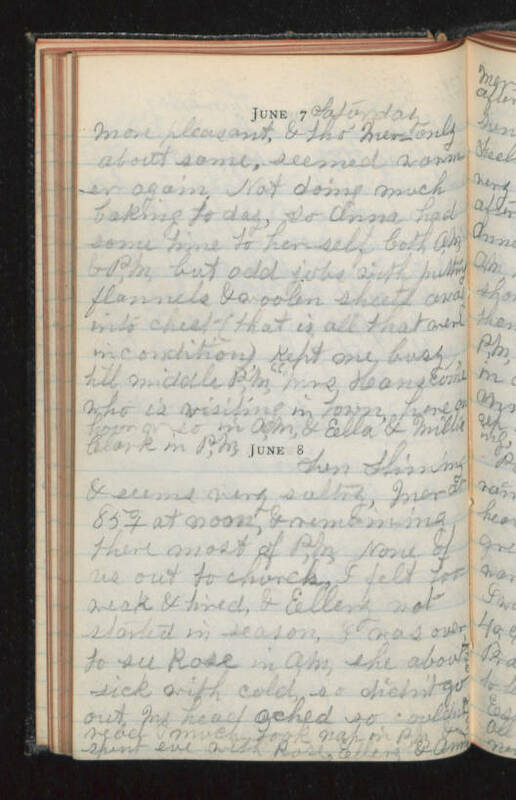 Not doing much baking to day, so Anna had some time to herself both A.M. & P.M. but odd jobs with putting flannels & woolen sheets away into chest (that is all that were in condition) Kept one busy till middle P.M. "Mrs Hanscome" who is visiting in town, here an hour or so in A.M. & Ella & Millie Clark in P.M. June 8 Sun shining & seems very sultry, Mer 85+ at noon, & remaining there most of P.M. None of us out to church, I felt too weak & tired, & Ellery not started in season. I was over to see Rose in A.M. she about sick with cold, so didn't go out. My head ached so couldn't read much. Took nap in P.M. & spent eve with Rose, Ellery & Anna.